Things are moving ahead on the SoBa project which is located on Catherine street. Digging has now stopped and things are moving upwards! For more information about SoBa Condos, check out the dedicated section with regularly updated construction and sales information. CLICK HERE to view. With warmer weather now here, construction crews have come back and continue moving forward. Check out the above time-lapse video of the progress from yesterday at the SoBa site on Catherine st. Questions about pre-construction condos in Ottawa? I would love to chat - fill out the form below. After a very quiet spring and summer, construction has officially started on Catherine street for SoBa condos. Being built by Brad Lamb of Lamb Developments (Toronto), this is the second building in Ottawa by the "King of Condos", first being Gotham located on Lyon. We have been told that the construction crew is currently digging the Slurry Wall, which should last about 100 days for a project of this size. Then the main excavation is able to begin. A building permit was issued on August 27th 2015 to Doran Construction for a partial permit for excavation and shoring and part foundation only. Construction is expected to take two years and be completed in 2017. Here is the construction site as of this morning - a screen shot from the live youtube camera of "Jimmy Joners" - Click here to view. Checked out the progress of the Lamb Development project, SoBA. This is how it sat since they pulled an old tank out of the ground (click for video) on April 1st. No word yet on what exactly they found or how it will impact timing and no word from Lamb on when they expect construction to officially start. Located at 203 Catherine st. in Centretown, the 23 storey, 240 unit building was set for completion late 2016. Fill out the form below if you are looking for more information on units currently available. For those unable to drive by to see the progress of the construction at SoBa on Catherine Street, Jimmy Joners currently has set up a live stream of the site. Questions about SoBA or Lamb Development? I would love to help get you an answer. Lamb Development Corp has officially announced date for the start of construction. Starting on March 1st, the sales office will close and construction will begin. Currently the building is at 86% sold out, with a good selection of units still remaining. In order to start the next phase with a bang, Lamb is offering a "Final Pre-Construction Promo" of up to $50,000 off prices depending on the size of the unit. Official amount ranges from $13,000 for the smallest unit, up to $50,000 off for the penthouse unit. 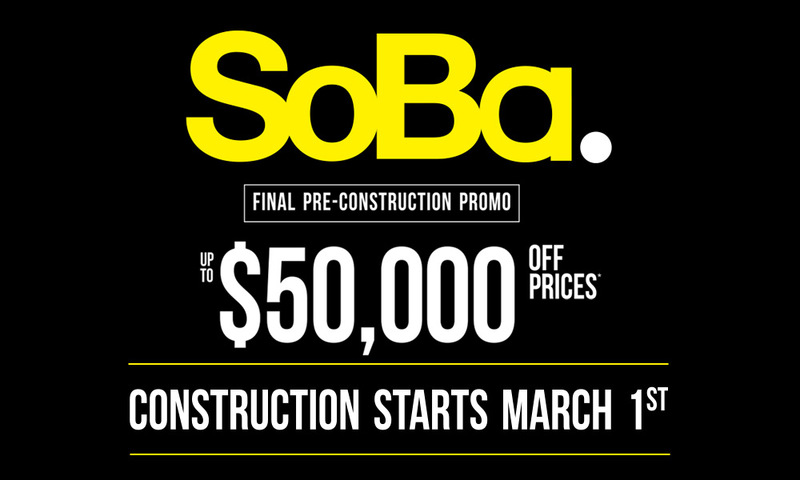 Interested in getting more information about SoBa condo units, or purchasing a condo in Ottawa? Let's chat!